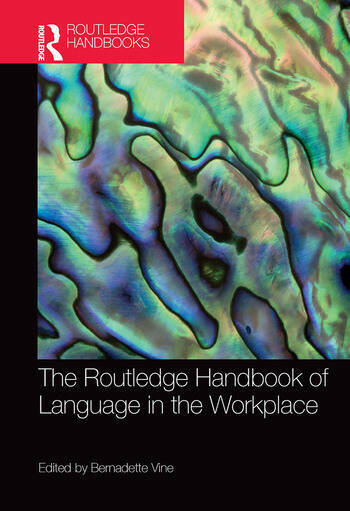 The Routledge Handbook of Language in the Workplace provides a comprehensive survey of linguistic research on language in the workplace written by top scholars in the field from around the world. The Handbook covers theoretical and methodological approaches, explores research in different types of workplace settings, and examines some key areas of workplace talk that have been investigated by workplace researchers. Issues of identity have become a major focus in recent workplace research and the Handbook highlights some core issues of relevance in this area, such as gender, leadership, and intercultural communication. As the field has developed, applications of workplace research for both native and non-native speakers have emerged. Insights can inform and improve input from practitioners training workers in a range of fields and across a variety of contexts, and the Handbook foregrounds some of the ways workplace research can do this. This is an invaluable resource for researchers and graduate students interested in learning more about workplace discourse. Bernadette Vine is Research Fellow on the Wellington Language in the Workplace Project (www.victoria.ac.nz/lwp/) and Corpus Manager for the Archive of New Zealand English, both based at the School of Linguistics and Applied Language Studies in Victoria University of Wellington, New Zealand. Bernadette’s research interests include workplace communication, leadership, and New Zealand English.